Explain the controlling factors of global climates. 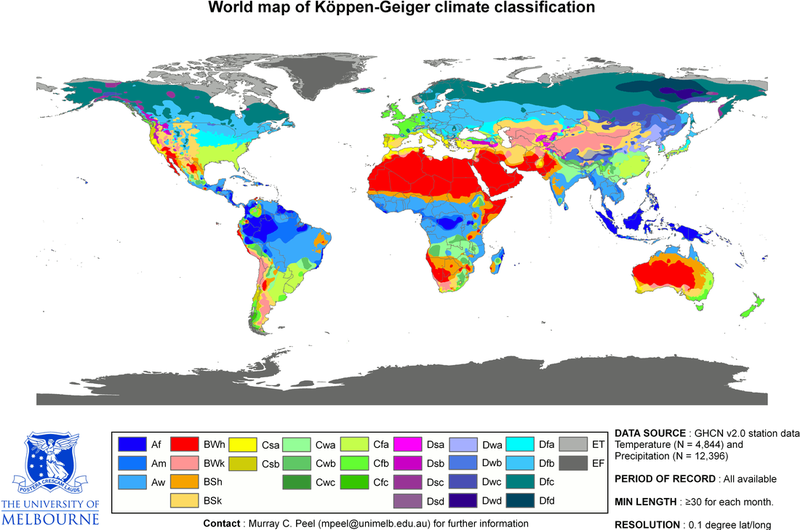 Describe the various global climates and biomes classified using the Koppen Classification System. Analyze Earth's climatic past and how scientists measure and collect climate data. Describe the causes of short-term and long-term climate change. Determine why the overwhelming majority of scientists believe the current warming of the planet is because of human activity. Although almost anything can happen with the weather, climate is more predictable. The weather on a particular winter day in San Diego may be colder than on the same day in Lake Tahoe, but, on average, Tahoe’s winter climate is significantly colder than San Diego’s. Climate then is the long-term average of weather. Good climate is why we choose to vacation in Hawaii in February, even though the weather is not guaranteed to be good! Climate is the average of weather in that location over a long period of time, usually for at least 30 years. A location’s climate can be described by its air temperature, humidity, wind speed and direction, and the type, quantity, and frequency of precipitation. Climate can change, but only over long periods of time. The climate of a region depends on its position relative to many things. These factors are described in the next sections. 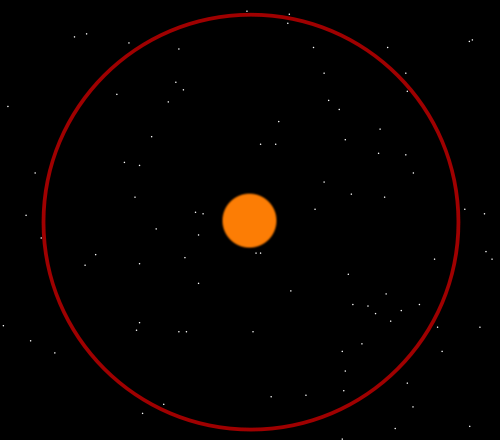 The equator receives the most solar radiation. Days are equally long year-round and the sun is just about directly overhead at midday. The polar regions receive the least solar radiation. The night lasts six months during the winter. Even in summer, the sun never rises very high in the sky. Sunlight filters through a thick wedge of atmosphere, making the sunlight much less intense. The high albedo, because of ice and snow, reflects a good portion of the sun's light. Recall from the Earth's Atmosphere chapter the circulation cells and global wind belts. The position of a region relative to the circulation cells and wind belts has a great effect on its climate. In an area where the air is mostly rising or sinking, there is not much wind. The Intertropical Convergence Zone (ITCZ) is the low pressure area near the equator in the boundary between the two Hadley Cells. The air rises so that it cools and condenses to create clouds and rain. Climate along the ITCZ is therefore warm and wet. Early mariners called this region the doldrums because their ships were often unable to sail because there were no steady winds. The ITCZ migrates slightly with the season. Land areas heat more quickly than the oceans. Because there are more land areas in the Northern Hemisphere, the ITCZ is influenced by the heating effect of the land. 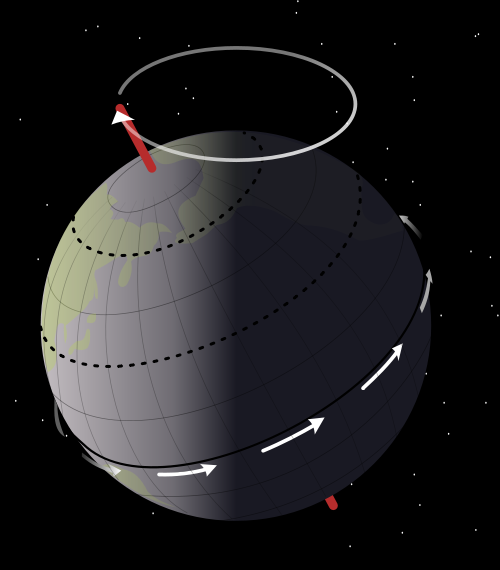 In Northern Hemisphere summer, it is approximately 5o north of the equator while in the winter it shifts back and is approximately at the equator. As the ITCZ shifts, the major wind belts also shift slightly north in summer and south in winter, which causes the wet and dry seasons in this area. Mariners named this region the horse latitudes. Sailing ships were sometimes delayed for so long by the lack of wind that they would run out of water and food for their livestock. Sailors tossed horses and other animals over the side after they died. Sailors sometimes didn’t make it either. The prevailing winds are the bases of the Hadley, Ferrell, and Polar Cells. These winds greatly influence the climate of a region because they bring the weather from the locations they come from. For example, in California, the predominant winds are the westerlies blowing in from the Pacific Ocean, which bring in relatively cool air in summer and relatively warm air in winter. Local winds also influence local climate. For example, land breezes and sea breezes moderate coastal temperatures. When a particular location is near an ocean or large lake, the body of water plays an extremely important role in affecting the region’s climate. A maritime climate is strongly influenced by the nearby sea. Temperatures vary a relatively small amount seasonally and daily. For a location to have a true maritime climate, the winds must most frequently come off the sea. A continental climate is more extreme, with greater temperature differences between day and night and between summer and winter. The ocean’s influence in moderating climate can be seen in the following temperature comparisons. Each of these cities is located at 37oN latitude, within the westerly winds. The temperature of the water offshore influences the temperature of a coastal location, particularly if the winds come off the sea. The cool waters of along the western United States is caused by a clockwise rotating ocean current that is bringing cold water from the arctic toward the equator. The climatic effect is that coastal regions of California, Oregon, and Washington are are cool. Coastal upwelling also brings cold, deep water up to the ocean surface off of California, which contributes to the cool coastal temperatures. But that same ocean current brings warm, tropical water to eastern Japan. In the Atlantic Ocean, the northern ocean current, called the Gulf Stream, brings warm water from the tropics to the southern states. This is a major reason why the southern states experience humid conditions in the summer and tornadoes because of all this warm moisture. The Gulf Stream also impacts Europe by bringing warm water northward, making this region that is rather northward warmer than expected. Air pressure and air temperature decreases with altitude. The closer molecules are packed together, the more likely they are to collide. Collisions between molecules give off heat, which warms the air. At higher altitudes, the air is less dense and air molecules are more spread out and less likely to collide. A location in the mountains has lower average temperatures than one at the base of the mountains. In Colorado, for example, Lakewood (5,640 feet) average annual temperature is 62 degrees F (17 degrees C), while Climax Lake (11,300 feet) is 42 degrees F (5.4 degrees C). Mountain ranges have two effects on the climate of the surrounding region. The first is something called the rainshadow effect, which brings warm dry climate to the leeward size of a mountain range, was described in the Earth's Atmosphere chapter. The second effect mountains have on climate systems is the ability to separate coastal regions from the rest of the continent. Since a maritime air mass may have trouble rising over a mountain range, the coastal area will have a maritime climate but the inland area on the leeward side will have a continental climate. A climate zone results from the climate conditions of an area: its temperature, humidity, amount and type of precipitation, and the season. A climate zone is reflected in a region’s natural vegetation. Perceptive travelers can figure out which climate zone they are in by looking at the vegetation, even if the weather is unusual for the climate on that day. The major factors that influence climate determine the different climate zones. In general, the same type of climate zone will be found at similar latitudes and in similar positions on nearly all continents, both in the Northern and Southern Hemispheres. The one exception to this pattern is the climate zones called the continental climates, which are not found at higher latitudes in the Southern Hemisphere. This is because the Southern Hemisphere land masses are not wide enough to produce a continental climate. The most common system used to classify climatic zones is the Köppen classification system. This system is based on the temperature, the amount of precipitation, and the times of year when precipitation occurs. Since climate determines the type of vegetation that grows in an area, vegetation is used as an indicator of climate type. A climate type and its plants and animals make up a biome. The organisms of a biome share certain characteristics around the world, because their environment has similar advantages and challenges. The organisms have adapted to that environment in similar ways over time. For example, different species of cactus live on different continents, but they have adapted to the harsh desert in similar ways. The Köppen classification system recognizes five major climate groups, each with a distinct capital letter A through E. Each lettered group is divided into subcategories. Some of these subcategories are forest (f), monsoon (m), and wet/dry (w) types, based on the amount of precipitation and season when that precipitation occurs. Tropical Moist (Group A) climates are found in a band about 15o to 25o N and S of the equator. What climate characteristics is the tropical moist climate group likely to have? Temperature: Intense sunshine; each month has an average temperature of at least 18oC (64oF). Rainfall: Abundant, at least 150 cm (59 inches) per year. The wet tropics have almost no annual temperature variation and tremendous amounts of rain fall year round, between 175 and 250 cm (65 and 100 inches). These conditions support the tropical rainforest biome. Tropical rainforests are dominated by densely packed, broadleaf evergreen trees. These rainforests have the highest number of species or biodiversity of any ecosystem. The tropical monsoon climate has very low precipitation for one to two months each year. Rainforests grow here because the dry period is short, and the trees survive off of soil moisture. This climate is found where the monsoon winds blow, primarily in southern Asia, western Africa, and northeastern South America. The tropical wet and dry climate lies between about 5o and 20o latitude, around the location of the ITCZ. In the summer, when the ITCZ drifts northward, the zone is wet. In the winter, when the ITCZ moves toward the equator, the region is dry. This climate exists where strong monsoon winds blow from land to sea, such as in India. Rainforests cannot survive the months of low rainfall, so the typical vegetation is savanna. This biome consists mostly of grasses, with widely scattered deciduous trees and rare areas of denser forests. The Dry Climates (Group B) have less precipitation than evaporation. Dry climate zones cover about 26% of the world’s land area. What climate characteristics is the dry climate group likely to have? Low-latitude, arid deserts are found between 15o to 30o N and S latitudes. This is where warm dry air sinks at high pressure zones. True deserts make up around 12% of the world’s lands. In the Sonoran Desert of the southwestern United States and northern Mexico, skies are clear. The typical weather is extremely hot summer days and cold winter nights. Although annual rainfall is less than 25 cm (10 inches), rain falls during two seasons. Pacific storms bring winter rains and monsoons bring summer rains. Since organisms do not have to go too many months without some rain, a unique group of plants and animals can survive in the Sonoran desert. Higher latitude semi-arid deserts, also called steppe, are found in continental interiors or in rainshadows. Semi-arid deserts receive between 20 and 40 cm (8 to 16 inches) of rain annually. The annual temperature range is large. In the United States, the Great Plains, portions of the southern California coast, and the Great Basin are semi-arid deserts. What climate characteristics is the moist subtropical group likely to have? Temperature: The coldest month ranges from just below freezing to almost balmy, between -3oC and 18oC (27o to 64oF). Summers are mild with average temperatures above 10oC (50oF). Seasons are distinct. Rainfall: There is plentiful annual rainfall. The Dry Summer Subtropical climate is found on the western sides of continents between 30o and 45o latitude. Annual rainfall is 30 to 90 cm (14 to 35 inches), most of which comes in the winter. The climate is typical of coastal California, which sits beneath a summertime high pressure for about five months each year. Land and sea breezes make winters moderate and summers cool. Vegetation must survive long summer droughts. The scrubby, woody vegetation that thrives in this climate is called chaparral. The Humid Subtropical climate zone is found mostly on the eastern sides of continents. Rain falls throughout the year with annual averages between 80 and 165 cm (31 and 65 inches). Summer days are humid and hot, from the lower 30's up to 40oC (mid-80's up to 104oF). Afternoon and evening thunderstorms are common. These conditions are caused by warm tropical air passing over the hot continent. Winters are mild, but middle-latitude storms called cyclones may bring snow and rain. The southeastern United States, with its hot humid summers and mild, but frosty winters, is typical of this climate zone. This climate lines western North America between 40o and 65o latitude, an area known as the Pacific Northwest. Ocean winds bring mild winters and cool summers. The temperature range, both daily and annually, is fairly small. Rain falls year round, although summers are drier as the jet stream moves northward. Low clouds, fog, and drizzle are typical. In Western Europe the climate covers a larger region since no high mountains are near the coast to block wind blowing off the Atlantic. Continental (Group D) climates are found in most of the North American interior from about 40°N to 70°N. What climate characteristics is the continental group most likely to have? Temperature: The average temperature of the warmest month is higher than 10°C (50°F) and the coldest month is below -3°C (-27°F). Precipitation: Winters are cold and stormy (look at the latitude of this zone and see if you can figure out why). Snowfall is common and snow stays on the ground for long periods of time. Trees grow in continental climates, even though winters are extremely cold, because the average annual temperature is fairly mild. Continental climates are not found in the Southern Hemisphere because of the absence of a continent large enough to generate this effect. The humid continental climates are found around the polar front in North America and Europe (Figure below). In the winter, middle-latitude cyclones bring chilly temperatures and snow. In the summer, westerly winds bring continental weather and warm temperatures. The average July temperature is often above 20oC (70oF). The region is typified by deciduous trees, which protect themselves in winter by losing their leaves. The two variations of this climate are based on summer temperatures. Dfa, long, hot summers: summer days may be over 38oC (100oF), nights are warm and the temperature range is large, perhaps as great as 31oC (56oF). The long summers and high humidity foster plant growth. Dfb, long, cool summers: summer temperatures and humidity are lower. Winter temperatures are below -18oC (0oF) for long periods. The subpolar climate is dominated by the continental polar air that masses over the frigid continent. Snowfall is light, but cold temperatures keep snow on the ground for months. Most of the approximately 50 cm (20 inches) of annual precipitation falls during summer cyclonic storms. 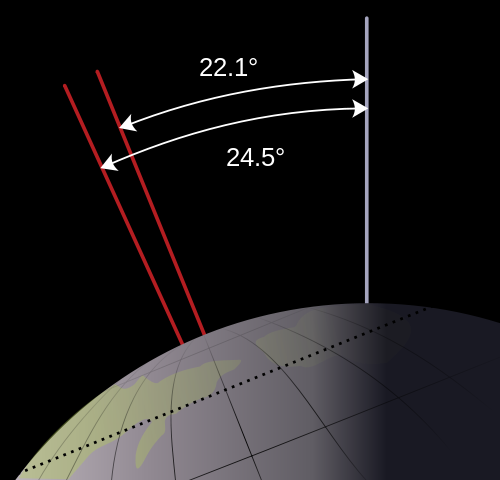 The angle of the Sun's rays is low but the Sun is visible in the sky for most or all of the day during the summer, so temperatures may get warm, but are rarely hot. These continental regions have extreme annual temperature ranges. The boreal, coniferous forests found in the subpolar climate are called taiga and have small, hardy, and widely spaced trees. Taiga vast forests stretch across Eurasia and North America. Polar climates are found across the continents that border the Arctic Ocean, Greenland, and Antarctica. What climate characteristics is the polar climate group most likely to have? Temperature: Winters are entirely dark and bitterly cold. Summer days are long, but the sun is low on the horizon so summers are cool. The average temperature of the warmest month at less than 10oC (50oF). The annual temperature range is large. Precipitation: The region is dry with less than 25 cm (10 inches) of precipitation annually; most precipitation occurs during the summer. The polar tundra climate is continental, with severe winters. Temperatures are so cold that a layer of permanently frozen ground, called permafrost forms below the surface. This frozen layer can extend hundreds of meters deep. The average temperature of the warmest months is above freezing, so summer temperatures defrost the uppermost portion of the permafrost. 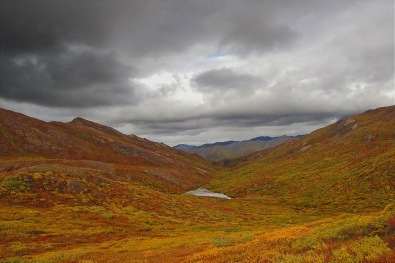 In winter, the permafrost prevents water from draining downward. In summer, the ground is swampy. Although the precipitation is low enough in many places to qualify as a desert, evaporation rates are also low, so the landscape receives more usable water than a desert. Because of the lack of ice-free land near the South Pole, there is very little tundra in the Southern Hemisphere (Figure below). The only plants that can survive the harsh winters and soggy summers are small ground-hugging plants like mosses, lichens, small shrubs, and scattered small trees that make up the tundra. Ice caps are found mostly on Greenland and Antarctica, about 9% of the Earth's land area. Ice caps may be thousands of meters thick. Ice cap areas have extremely low average annual temperatures, e.g. -29oC (-20oF) at Eismitte, Greenland. Precipitation is low because the air is too cold to hold much moisture. Snow occasionally falls in the summer. When climate conditions in a small area are different from those of the surroundings, the climate of the small area is called a microclimate. The microclimate of a valley may be cool relative to its surroundings since cold air sinks. The ground surface may be hotter or colder than the air a few feet above it, because rock and soil gain and lose heat readily. Different sides of a mountain will have different microclimates. In the Northern Hemisphere, a south-facing slope receives more solar energy than a north-facing slope, so each side supports different amounts and types of vegetation. Altitude mimics latitude in climate zones. Climates and biomes typical of higher latitudes may be found in other areas of the world at high altitudes. For the past 2,000 years, climate has been relatively mild and stable when compared with much of Earth’s history. Why has climate stability been beneficial for human civilization? Stability has allowed the expansion of agriculture and the development of towns and cities. Since the end of the Pleistocene, the global average temperature has risen about 4 degrees C (7 degrees F). Glaciers are retreating and sea level is rising. While climate is getting steadily warmer, there have been a few more extreme warm and cool times in the last 10,000 years. Changes in climate have had effects on human civilization. In an El Niño year, when water temperature reaches around 28 degrees C (82 degrees F), the trade winds weaken or reverse direction and blow east (toward South America). Warm water is dragged back across the Pacific Ocean and piles up off the west coast of South America. With warm, low-density water at the surface, upwelling stops. Without upwelling, nutrients are scarce and plankton populations decline. Since plankton form the base of the food web, fish cannot find food, and fish numbers decrease as well. All the animals that eat fish, including birds and humans, are affected by the decline in fish. By altering atmospheric and oceanic circulation, El Niño events change global climate patterns. An El Niño cycle lasts one to two years. Often normal circulation patterns resume. Sometimes circulation patterns bounce back quickly and extremely, called La Niña. In a La Niña year, as in a normal year, trade winds moves from east to west and warm water piles up in the western Pacific Ocean. Ocean temperatures along coastal South America are colder than normal (instead of warmer, as in El Niño). Cold water reaches farther into the western Pacific than normal. Other important oscillations are smaller and have a local, rather than global, effect. The North Atlantic Oscillation mostly alters climate in Europe. The Mediterranean also goes through cycles, varying between being dry at some times, and warm and wet at others. Many processes can cause climate to change. 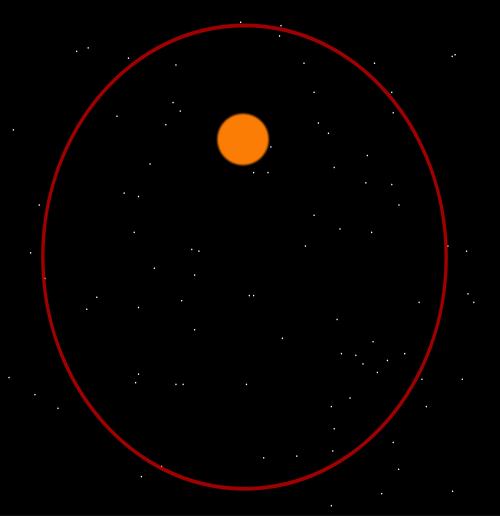 These include changes in the amount of energy the Sun produces over years; the positions of the continents over millions of years; in the tilt of Earth's axis; orbit over thousands of years; that are sudden and dramatic because of random catastrophic events, such as a large asteroid impact; in greenhouse gases in the atmosphere, caused naturally or by human activities. Plate tectonic movements may help start an ice age. When continents are located near the poles, ice can accumulate, which may increase albedo and lower global temperature. Low enough temperatures may start a global ice age. Plate motions trigger volcanic eruptions, which release dust and CO2 into the atmosphere. Ordinary eruptions, even large ones, have only a short-term effect on weather. Massive eruptions of the fluid lavas that create lava plateaus release much more gas and dust, and can change climate for many years. This type of eruption is exceedingly rare; none has occurred since humans have lived on Earth. Greenhouse gas levels have varied throughout Earth history. For example, CO2 has been present at concentrations less than 200 parts per million (ppm) and more than 5,000 ppm. But for at least 650,000 years, CO2 has never risen above 300 ppm, during either glacial or interglacial periods. Natural processes add (volcanic eruptions and the decay or burning of organic matter) and remove absorption by plants, animal tissue, and the ocean) CO2 from the atmosphere. When plants are turned into fossil fuels the CO2 in their tissue is stored with them. So CO2 is removed from the atmosphere. What does this do to Earth’s average temperature? With more greenhouse gases trapping heat, average annual global temperatures are rising. This is known as global warming. While temperatures have risen since the end of the Pleistocene, 10,000 years ago, this rate of increase has been more rapid in the past century, and has risen even faster since 1990. The nine warmest years on record have all occurred since 1998, and the 10 of the 11 warmest years have occurred since 2001 (through 2012). The 2000s were the warmest decade yet. Annual variations aside, the average global temperature increased about 0.8 degrees C (1.5 degrees F) between 1880 and 2010, according to the Goddard Institute for Space Studies, NOAA. The United States has long been the largest emitter of greenhouse gases, with about 20% of total emissions in 2004. As a result of China’s rapid economic growth, its emissions surpassed those of the United States in 2008. However, it’s also important to keep in mind that the United States has only about one-fifth the population of China. What’s the significance of this? The average United States citizen produces far more greenhouse gases than the average Chinese person. If nothing is done to decrease the rate of CO2 emissions, by 2030, CO2 emissions are projected to be 63% greater than they were in 2002. The amount CO2 levels will rise in the next decades is unknown. What will this number depend on in the developed nations? What will it depend on in the developing nations? In the developed nations it will depend on technological advances or lifestyle changes that decrease emissions. In the developing nations, it will depend on how much their lifestyles improve and how these improvements are made. Computer models are used to predict the effects of greenhouse gas increases on climate for the planet as a whole and also for specific regions. If nothing is done to control greenhouse gas emissions and they continue to increase at current rates, the surface temperature of the Earth can be expected to increase between 0.5 degrees C and 2.0 degrees C (0.9 degrees F and 3.6 degrees F) by 2050 and between 2 degrees and 4.5 degrees C (3.5 degrees and 8 degrees F) by 2100, with CO2 levels over 800 parts per million (ppm). On the other hand, if severe limits on CO2 emissions begin soon, temperatures could rise less than 1.1 degrees C (2 degrees F) by 2100. Whatever the temperature increase, it will not be uniform around the globe. A rise of 2.8 degrees C (5 degrees F) would result in 0.6 degrees to 1.2 degrees C (1 degree to 2 degrees F) at the equator, but up to 6.7 degrees C (12 degrees F) at the poles. So far, global warming has affected the North Pole more than the South Pole, but temperatures are still increasing at Antarctica. Glaciers are melting and vegetation zones are moving uphill. If fossil fuel use exploded in the 1950s, why do these changes begin early in the animation? Does this mean that the climate change we are seeing is caused by natural processes and not by fossil fuel use? As greenhouse gases increase, changes will be more extreme. Oceans will become slightly more acidic, making it more difficult for creatures with carbonate shells to grow, and that includes coral reefs. A study monitoring ocean acidity in the Pacific Northwest found ocean acidity increasing ten times faster than expected and 10% to 20% of shellfish (mussels) being replaced by acid tolerant algae. Plant and animal species seeking cooler temperatures will need to move poleward 100 to 150 km (60 to 90 miles) or upward 150 m (500 feet) for each 1.0 degrees C (8 degrees F) rise in global temperature. There will be a tremendous loss of biodiversity because forest species can’t migrate that rapidly. Biologists have already documented the extinction of high-altitude species that have nowhere higher to go. Weather will become more extreme with heat waves and droughts. Some modelers predict that the Midwestern United States will become too dry to support agriculture and that Canada will become the new breadbasket. In all, about 10% to 50% of current cropland worldwide may become unusable if CO2 doubles. There are global monitoring systems to help monitor potential droughts that could turn into famines if they occur in politically and socially unstable regions of the world and if appropriate action isn't taken in time. One example is FEWS NET, which is a network of social and environmental scientists using geospatial technology to monitor these situations. But even with proper monitoring, if nations don't act, catastrophes can occur like in Somalia from 2010-2012. You may notice that the numerical predictions above contain wide ranges. 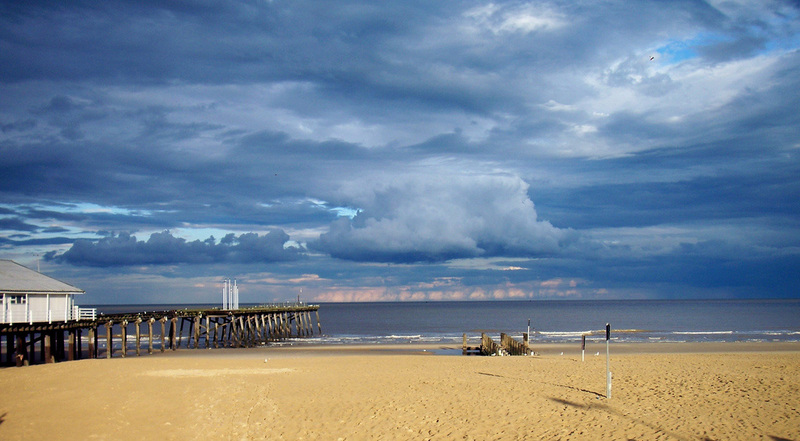 Sea level, for example, is expected to rise somewhere between 18 and 97 cm — quite a wide range. What is the reason for this uncertainty? It is partly because scientists cannot predict exactly how the Earth will respond to increased levels of greenhouses gases. How quickly greenhouse gases continue to build up in the atmosphere depends in part on the choices we make. An important question people ask is this: Are the increases in global temperature natural? In other words, can natural variations in temperature account for the increase in temperature that we see? The scientific data shows no, natural variations can not explain the dramatic increase in global temperatures. Changes in the Sun’s irradiance, El Niño and La Niña cycles, natural changes in greenhouse gas, plate tectonics, and the Milankovitch Cycles cannot account for the increase in temperature that has already happened in the past decades. In December 2013 and April 2014, the Intergovernmental Panel on Climate Change (IPCC) released a series of damaging reports on not only the current scientific knowledge of climate change, but also on the vulnerability and impacts to humans and ecosystems. Below are two videos detailing the physical science of climate change (Working Group I), and the risks and impacts to the planet (Working Group II). But it is important to get a strong, data driven understanding of climate change. Along with the IPCC, other organizations like the United Nations Environmental Programme (UNEP), World Health Organizations, World Meteorological Organization (WMO), NASA, the National Oceanic and Atmospheric Administration (NOAA), and the U.S. Environmental Protection Agency (EPA).